This session will provide an overview of the current renewable energy and distributed generation policy landscape in WI, and its impacts on the solar, wind, hydropower, and biogas markets. The presentation will include current and potential legislative and public service commission activities, as well as opportunities to advance policies that support the growth of renewable energy markets in WI. Tyler Huebner joined RENEW Wisconsin as the organization's 3rd Executive Director in June 2013. He grew up in IA being fascinated by wind turbines at a nearby middle school, and has pursued various ventures in the clean energy space. He is passionate about the transformation of our country's energy system to renewable sources. 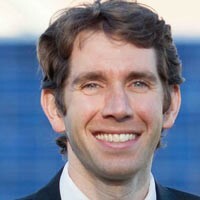 After graduating in electrical engineering from the University of IA, he earned his Masters degree at Stanford University in the Atmosphere & Energy Program, where he also co-founded a major conference and student group called Energy Crossroads (now Stanford Energy Club) focused on the intersection between business, national security, and environmental interests in clean energy. Since then, he has been a consultant with ICF International working on energy efficiency projects with utility companies and the U.S. EPA, run grant programs at the U.S. Department of Energy in low-income weatherization, and worked for the State of WI's Division of Energy Services prior to joining RENEW.